We have learned that vortices can have devastating effects when an airplane flies through the wash of another airplane. The wings cause powerful spirals of air moving clockwise off the left wing and counterclockwise coming off the right wing. This holds for birds flying as well. The same vortex patterns emerge, albeit slightly different since the wings are in motion relative to the body. Now, imagine looking up on a fall day and seeing a flock of geese flying in the V formation we have all seen before. That formation is unique and a brilliant adaptation for flying long distances. Let’s break it down and see why that is the optimal positioning. First, let’s imagine the birds flying in a straight line all at the same distance from the ground. The way the spirals of air are turning means that the bird will be constantly fighting the effects of those air spirals pushing it down towards the ground, making flight more laborious to stay at the same altitude. It’s a bit difficult to imagine but look at the picture above and visualize the wingtips being halfway through each spiral. The air will be coming over the top of each wing pushing down as it continues to finish the spiral. This means significantly more work for the bird overall. But that’s not where the birds fly. They fly in a V, each one staggered slightly above the bird in front of it and either to its left or right side. Now picture where this puts the wings of the bird. One will be clear from all turbulent air and the other sitting above the vortex in such a way that the spiral actually pushes the wing and bird UP. Lets take the case of a goose flying to the left of the bird in front of it. Its left wing will be clear of the turbulence so we will ignore it. The right wing however will have the vortex coming up from underneath it pushing it up as it attempts to complete the spiral. It’s the opposite effect of flying directly behind the bird. The draft from the lead bird helps the bird following it fly with less effort. Geese use this technique to cover far more ground than they would be able to if they were flying alone. Each bird rotates into the lead position, taking turns flying in what is the most difficult position since it lacks the helpful updraft. This way they all tire less quickly and can fly further with the amount of energy they have. 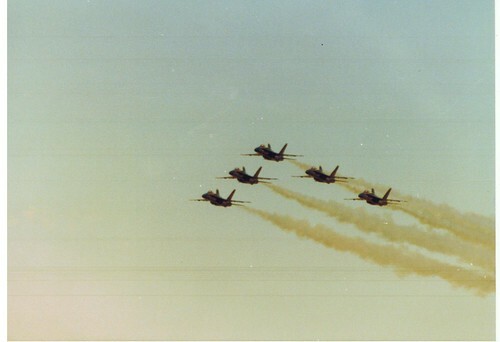 In the picture below you can see the all-famous Blue Angels team utilizing this effect to fly close together to perform their breathtaking aerobatics. Great post, Ryan! You came upon many of the same conclusions that I did when I was doing some research on this topic. I liked your post, as it’s written in an accessible language to explain a tricky phenomenon. I’ve taken the liberty of editing a few spelling mistakes that made my eyes hurt. This is for you: study it carefully! This post really helped clear things up about vortices, thanks! I guess now we know why the V is a perfect position for not only birds, but also “the mighty ducks”.